100% pure Mineral Salt, from a pristine area in the Himalayas. Over 100 Million years ago the foothills of the Himalayas were once covered by an ancient ocean. 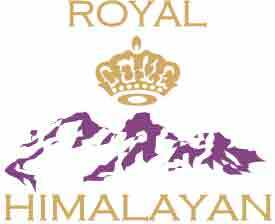 Royal Himalayan Pink Crystal Salt became trapped in the Himalayas due to pressure and the shifting earth’s crust. Under tremendous pressure for millions of years the salt congealed into perfect crystalline structure. 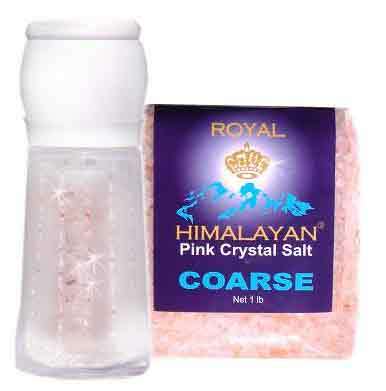 Royal Himalayan Pink Crystal Salt contains 84+ minerals in the same proportion which are found in human cells. When water and salt combine they activate to harmonize cell metabolism, by supporting acid/alkaline balance, re-mineralization of the cells, maintaining proper electrolyte levels. and assist the cleansing of the body through better elimination of toxins and heavy metals. Our Pink Crystal Salt is naturally hand-mined, washed, sun-dried, and stone ground with great care. It has become the first choice for many of the world’s renowned chefs for enhancing the flavor of their signature cuisine. Royal Himalayan Pink Crystal Salt is packed in a convenient eco-friendly biodegradable cellophane bag and can easily be refilled into your favorite salt container (preferably with a few rice grains to avoid caking). 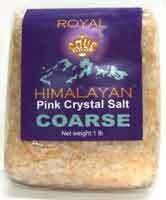 ROYAL HIMALAYAN Pink Crystal Salt has become the first choice for American cooking, replacing all other salts. 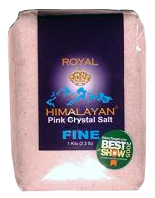 Please note: ROYAL HIMALAYAN Pink Crystal Salt will bring out the flavors of your cooking, baking, raw dishes and even desserts. 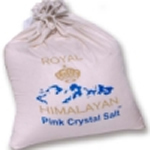 * ROYAL HIMALAYAN Pink Crystal Salt amplifies all flavors and tastes! Packed in 98% biodegradable cellophane bag. For the salt connoisseur, a coarse version is available that can be ground in the world’s finest ceramic salt mill. Freshly ground Pink Crystal Salt is the perfect “finishing” salt, sprinkled over the food just before serving. The finest metal free ceramic salt mill on the market. We recommend this specific salt mill to grind our precious salt to maintain its high quality. Made from mostly glass with a very durable ceramic grinder, so no metal comes in contact with the salt. 10 kilo (22.3 lbs) of ROYAL HIMALAYAN Fine Salt or Coarse Salt in a 100% unbleached cotton bag. 16 oz bag of Royal Himalayan Coarse Salt plus 1 Kyocera Ceramic Salt Mill.